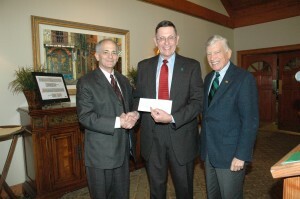 Pictured here during the check presentation at the Auxiliary’s Annual Membership Luncheon on May 1, 2013 at Kings Creek Country Club are, left to right, Jeff Fried, Beebe Medical Center President and CEO; Mike Clemmer, Beebe Auxiliary President, and Judge Bill Lee, Chairman, Beebe Medical Center Board of Directors. The Beebe Medical Center Auxiliary presented Beebe Medical Center with a check in the amount of $310,000 during the Auxiliary’s recent annual meeting and luncheon. The check represents the single largest annual gift the Auxiliary has given to Beebe and will be used to assist with the building of Beebe Medical Center’s new outpatient services in Georgetown. Beebe Medical Center is building a two-story medical arts building in the new College Park development in Georgetown across from Delaware Technical & Community College and adjacent to La Red. The building will bring a broad range of health services under one roof, making it convenient for patients. Beebe Medical Center will lease the first floor and offer the following services: Beebe Lab Express; Beebe Imaging to include radiology, CT and MRI scans, ultrasound and mammography; and Beebe Rehab Services to include physical rehab, occupational rehab and speech/language pathology. A Beebe primary care physician and a walk-in clinic also will be housed there. Other physician offices will be located upstairs. The services are expected to open later this year. “I want to thank you for all that you do for Beebe,” Jeffrey M. Fried, FACHE, President and CEO of Beebe Medical Center, told the Auxiliary attending the luncheon. “We certainly would not be able to do what we do without your support and commitment to quality patient care and to our community.” Mr. Fried was honored for his support of the organization. Auxiliary President Michael Clemmer read a proclamation of appreciation for Mr. Fried and announced that the Auxiliary Board had made Mr. Fried a Distinguished Honorary Auxiliary member. The Rev. William Woodhall, who gave the invocation, was made an Honorary Auxiliary member. Others who were recognized for their support of the Auxiliary were: Kathi Fryling, Director of Support Services at Beebe Medical Center; Howard Willis, Nutritional Services Manager at Beebe Medical Center; and the cadets of the Cape Henlopen Army JROTC. Beebe Auxiliary is the oldest fundraising organization for Beebe Medical Center. It held its first recorded meeting in 1936 in the Lewes home of Mrs. Edwin Marshall. Today, it has 270 members. In recent years, the Auxiliary has donated nearly $3 million to Beebe Medical Center. Beebe Auxiliary raises funds through several initiatives including: Beebe’s Treasure Chest Thrift Shop in the Midway Shopping Center; the Gift Shop at Beebe Medical Center; the Auxiliary’s Arts and Craft Committee; the annual Plant Sale; the Children’s Fun Fest; and various employee sales events. In addition to financial contributions, Auxiliary members volunteer in the hospital, at the Patient Information Desk. Over the last year, Auxiliary members contributed more than 32,000 hours of volunteer service to Beebe Medical Center.